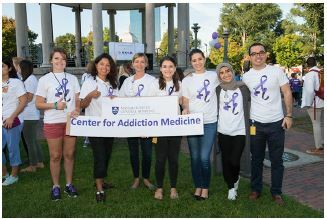 The Center for Addiction Medicine offers many opportunities for professional and personal development, exposure to MGH learning environment, team work and external collaboration making working at CAM a unique and invaluable experience. Postdoctoral researcher needed at the Center for Addiction Medicine in the Department of Psychiatry at Massachusetts General Hospital/Harvard Medical School to participate in community-based, translational research on substance use in vulnerable populations, including children/adolescents and patients with serious mental illness. Fellow will work on two ongoing trials including, (1) a PCORI-funded large pragmatic clinical trial to determine whether academic detailing and health outreach worker support to patients and providers will improve smoking cessation rates in people with serious mental illness, and (2) an NIH-funded clinical trial designed to examine the effects of cannabis abstinence on learning and neurocognition among adolescents in school-based settings across the greater Boston area. Multi-disciplinary approaches include, but are not limited to psychopharmacologic treatment delivery, behavioral assessments, genetic analyses, pharmacological modeling, cognitive testing, and clinical outcomes. In addition to hands-on conduct of research protocols, duties will also include clinical supervision, manuscript preparation, presentation of findings at conferences, and management of research assistants. Fellow will participate actively in ongoing research and grant submissions, and will be encouraged to develop an independent, related line of inquiry through conduct of pilot projects, preparation of publications and presentations using new and existing datasets, and submission of independent research grant. Candidates should have a PhD/MD or equivalent degree. Licensed clinicians strongly preferred. Excellent analytic skills and verbal/written communication skills are required. Qualified applicants should also have a strong interest in public health as demonstrated by a track record of relevant first-author research papers published in peer-reviewed journals. We are looking for highly motivated, self-driven, creative, and interactive scientists who have high potential for an independent research career. We are seeking an individual interested in an interdisciplinary role as a Programmer at the MGH Center for Addiction Medicine. Working independently and with minimal supervision, he or she will be responsible for programming and quality assurance of databases and computer task paradigms to be used in behavioral testing and in the MRI environment. He or she will also be responsible for analysis of neuroimaging data, and advanced programming in statistical software. Work with PIs of several studies to program, test, and maintain original and existing user-friendly computer tasks to be used both in and outside of fMRI scanners to test various psychometric properties of participants enrolled in addiction-related research studies. Perform and train other research staff in the management and compilation of computer task data output and assist in its analysis. Offer technical input as a member of a team in the improvement of ongoing and the creation of new research studies. Assist in both performing and developing analysis streams of fMRI data using a range of different software tools. Assist in the preparation of research data and methods for both written publications and presentations. Run fMRI scans including computer tasks with participants enrolled in fMRI imaging studies and serve as a backup for measures taken during non-scan study visits. Create and maintain REDCap online databases for all information collected throughout research studies including computer tasks. Collect and maintain subject information database for study using the REDCap (Research Electronic Data Capture) or other data capture programs. Perform quality assurance checks on database. Assist with data analysis and manuscript preparation. Prepares study reports, annual reviews, adverse event reports, and study document modifications. Minimum Requirements: Bachelor’s degree in psychology, neuroscience, premedical sciences, computer science, or related science, strong quantitative and technical skills, a willingness and ability to learn, and interest in working with human research participants, and a diverse research team including psychiatrists, psychologists, neuroscientists, imaging scientists, a team of research assistants/coordinators, and support staff. The position requires excellent organizational skills, good interpersonal skills, strong quantitative skills, attention to detail, the ability to prioritize multiple tasks and handle fluctuating priorities and deadlines, good communication skills, the ability to work independently as well as with others, and an interest in the work of the Center for Addiction Medicine. Strong computer skills are required. Familiarity with a wide variety of software tools for data collection and analysis such as: Python, Matlab, PsychoPy, FSL, Freesurfer, SPSS, R, or shell scripting is beneficial. This is an excellent research opportunity for someone interested in graduate school in cognitive neuroscience, computer science, psychology, medicine, or related fields. Please send a cover letter and resume to Rachel Plummer (rplummer1@mgh.harvard.edu) to apply. The coordinator’s responsibilities at the Center for Addiction Medicine will include serving as the primary research coordinator on a clinical research study. Working under the supervision of senior staff, he or she will be responsible for patient scheduling and recruitment as well as all subject-oriented study procedures, such as the administration of psychiatric scales and testing protocols, the careful monitoring of adverse events and worsening psychiatric or mood disturbances, administrative duties related to the careful operation of study protocol, and database programming and quality assurance. Recruit and schedule subjects for participation. Coordinate scheduling of study with area collaborators. Produce and maintain all documentation for the Institutional Review Board. Perform primary data collection at study visits, including neuropsychological testing and limited physiological monitoring. Maintains all related data. Purchase or reimburse for all supplies required for the study; monitor study inventory. Prepare study reports, annual reviews, adverse event reports, and study document modifications. Minimum Requirements: Bachelor’s degree in psychology, neuroscience, premedical sciences or related science, strong quantitative skills, a willingness and ability to learn, and interest in working with human research participants, and a diverse research team including psychiatrists, psychologists, neuroscientists, imaging scientists, a team of research assistants/coordinators, and support staff. The position requires excellent organizational skills, as well as proficiency in Microsoft Word, Excel, and Powerpoint. Good interpersonal skills, strong quantitative skills, attention to detail, the ability to prioritize multiple tasks and handle fluctuating priorities and deadlines, good communication skills, the ability to work independently as well as with others, and an interest in the work of the Center for Addiction Medicine. Computer and statistical programming skills are preferred. To apply follow the link http://www.massgeneral.org/careers/jobsearch.aspx and search job code 3057995.